Bicycles are incredible. They are a quick form of transportation. They are fantastic cardiovascular exercise without the pounding joint pain associated with running. More affordable than a car and with a fraction of the maintenance headache. Throw in the environmental benefits of zero emissions and no fossil fuels used and it’s perfect, right? Then you get it home and you realize you have no place to put it. It doesn’t matter if you have a 3 car garage or a studio apartment. 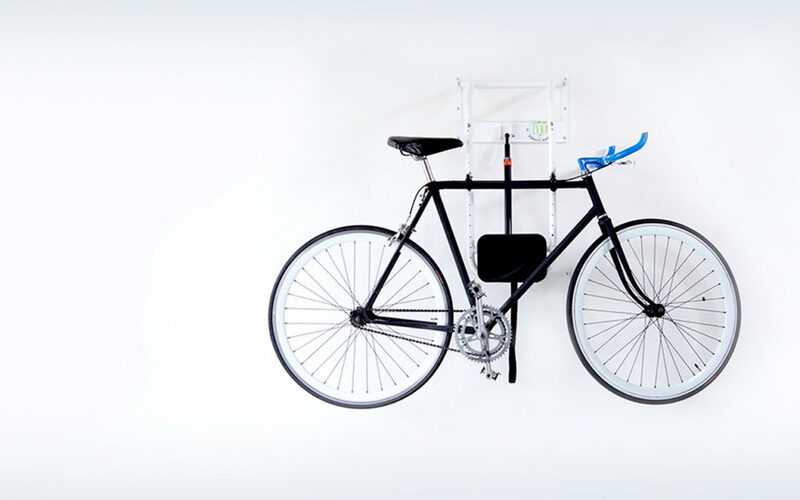 There just is no place in your home fit to put a bicycle. 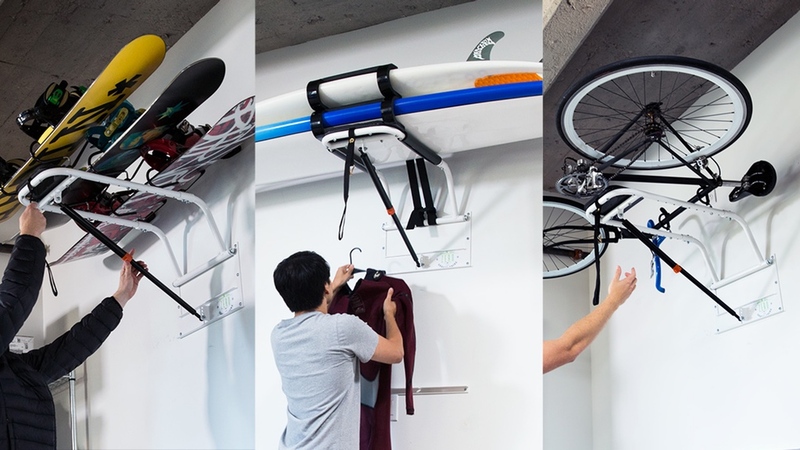 Well the team at Zero Gravity Racks sought to find a solution to this problem and in the process created a product that solved not only the problem of bicycle storage but also skis, surfboards, stand-up paddleboards, and plenty of other space hogs. When was Zero Gravity Racks started? Zero Gravity was started in Sept of 2015 with the first working prototype. Mark: The team is comprised of myself, my business partner Sam and my son Nick. Sam and I have been friends and worked together for the past 20 years. 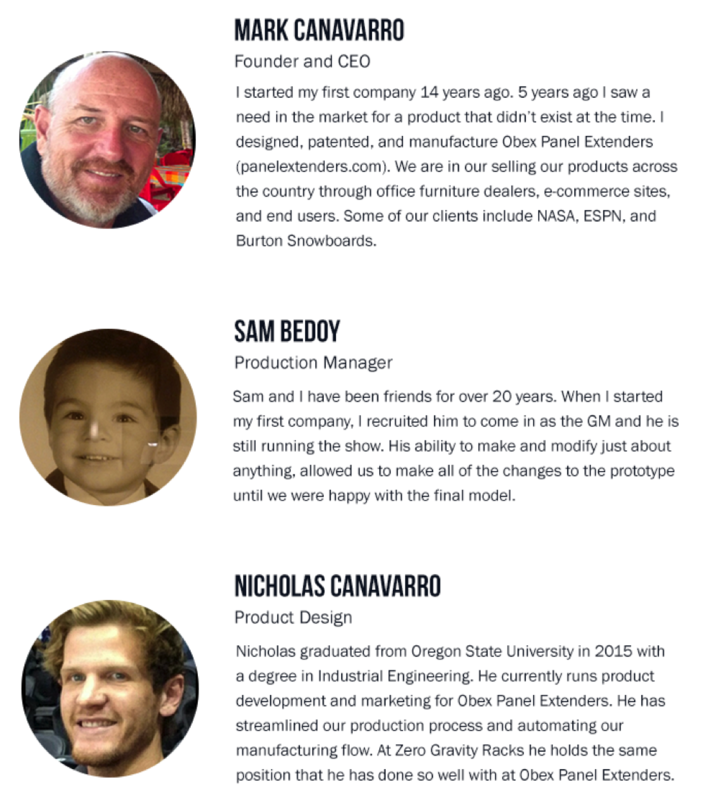 Nick is my son and after graduating from OSU (Oregon State University) with a degree in engineering, we promptly brought him onto the team. What were you doing for work prior to Zero Gravity Racks? Mark: Sam and I started working together 20 years ago at a cubicle manufacturing company. I was the sales manager and Sam was involved in production. 14 years ago I left that company and founded an office furniture dealership and brought Sam with me and then 5 years ago we designed and patented a product for the office furniture market (www.panelextenders.com). Nick: I was attending school at Oregon State University studying engineering. What was your inspiration for designing Zero Gravity Racks? It seems like everywhere you look there are self-storage facilities. People like their stuff and with higher real estate costs and denser housing there is less room for it. In my years designing offices I would constantly be tasked with getting more people in smaller spaces. One of the ideas I always suggested was that in making smaller workstations, we could still create a decent amount of desk space by raising items off of the desktops. So I would suggest upper storage cabinets and shelving. Zero Gravity racks uses the same concept of making use of the underutilized spaces in your garage, apartment, or shed. Up in the air. All of the team members are avid outdoor enthusiasts between surfing, SUPing, biking, fishing, kayaking. Did you go through a lot of design iterations? Since we have brought the Zero Gravity Rack to the public, we have received quite a few requests for different attachments. Two that we are currently working on are the kayak mount and also an attachment to hold a car cargo box. How did you find the experience of running a Kickstarter Campaign? Did you find it enjoyable/stressful/rewarding/etc…? I have never run a crowd funding campaign so I thought it would be an interesting ride and it has been. It is very different from setting up my dealership and manufacturing company but it allows you to see marketing in a different light. The stress level was low up until the morning of the launch. Then at 8am on launch day my anxiety level definitely went up. After a year of planning and months of pre-launch campaigning, it all comes down to this. It doesn’t matter how many family and friends tell you how cool an idea it is, the results of the launch are what matters. What are your most popular attachments outside of the standard bike rack? It is summer so the majority of our attachments, have been surf and SUP racks. Where can someone purchase Zero Gravity Racks? They can preorder these on our Kickstarter campaign page at www.zerogravityracks.com. Our Kickstarter campaign still has another month left and we have a few super early bird discount spots available. How do you guys see yourselves growing in the next 5 years? We should have the Kickstarter preorders shipping Jan 1st; until then we are working on a number of different distribution channels to get ZGR to market from e-commerce to traditional brick and mortar retail. We are looking at a number of different space saving adapters from a storage unit that attaches to the rack and raises up similar to a car carrier rack to the kayak rack. What has been your favorite part of working with Zero Gravity Racks? Favorite part has been the opportunity to work with my son. We want to thank everybody for their support and input both good and bad. If you are interested in supporting our campaign please check it out at zerogravityracks.com and tell your family and friends.